Remember that mini mini quilt craze that spread like wildfire among quilty bloggers about eight months ago? Yeah, me too. 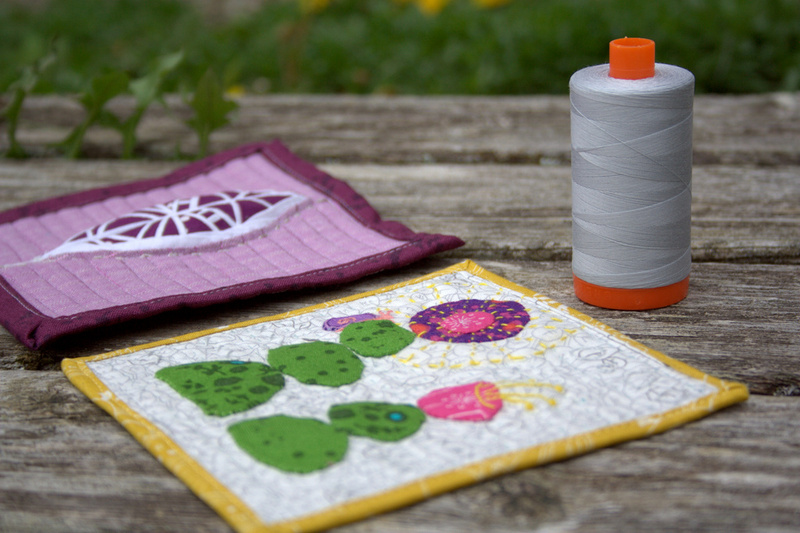 The fun news is that with the recent feature in Make Modern magazine, the mini mini quilt spark is being fanned back into life with a Mini Mini Quilt Challenge. You can see a fun inspiration gallery of mini mini quilts in the recent issue of Make Modern (Issue 11), including a couple made by yours truly, and there’s a community wide challenge running now through June 20th to help inspire more mini mini madness. 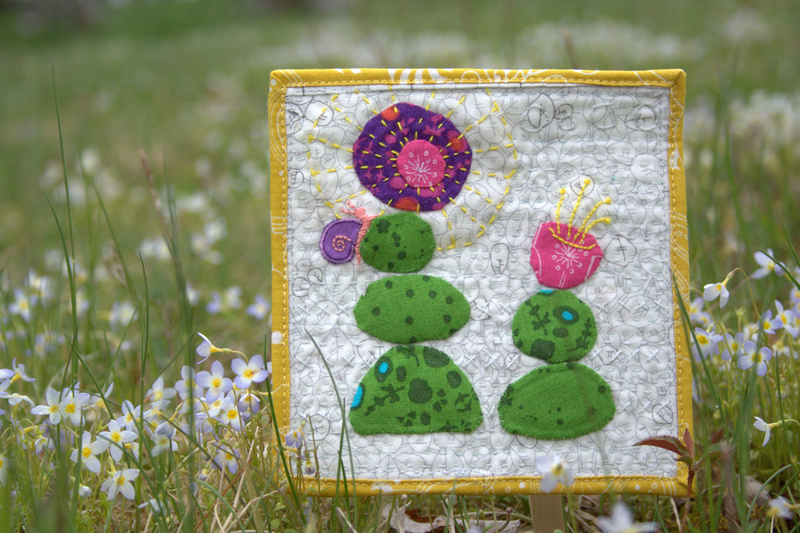 Read more about the challenge here, or check out the hashtag #MMminimini to see what creative mini mini quilts have been created thus far (and add your own to the pool!). For some reason, I latched onto the AG grove in grass green (of course), paired with the favorite colors of pinks, purples, oranges, yellows. 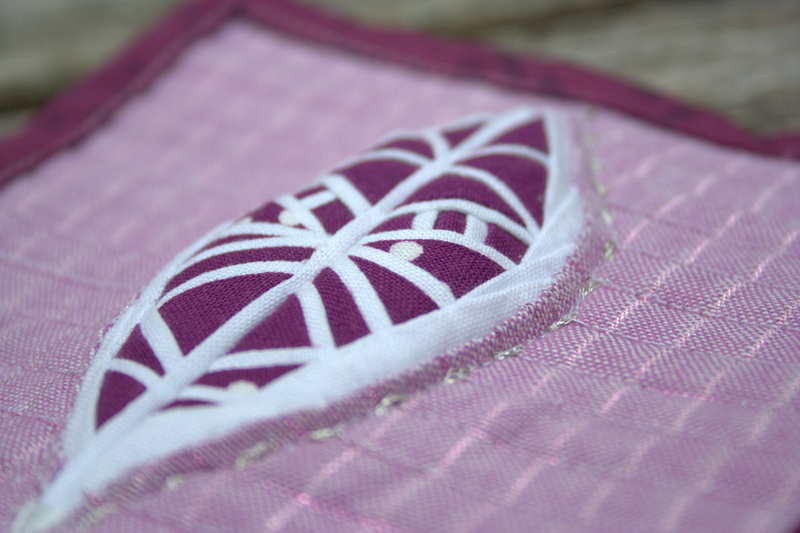 I wanted to create something with natural and soft shapes, so immediately thought of needle-turn applique. The rest of this mini mini just sort of happened as I stitched. The mod leaves and flowers are needle-turn appliqued, and then I used 12 wt Aurifil thread to embroider details on the flowers. The snail was not initially intended to be part of this mini mini, but in fact was the result of a mini mini travesty: my three year old son found my little scissors and in playing around, cut a small hole right in the mini mini quilt!! After taking many deep breaths, probably yelling at least once and emphatically saying that it was NOT ok to cut mommy’s sewing, I decided to make lemonade out of lemons and needle-turn a little patch over the hole. 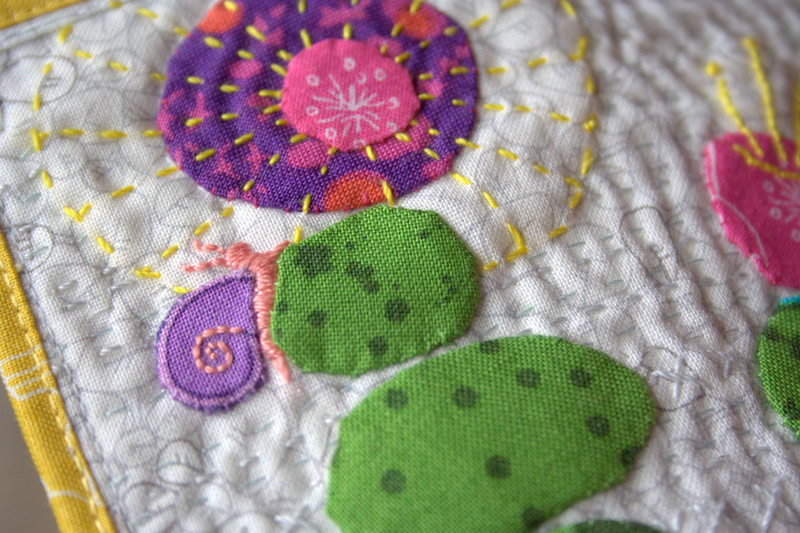 With a bit of embroidery embellishment, a little slow growing snail was born. It ends up this snail was the perfect symbol of this project, and ultimately inspired its name: Slow Growth. 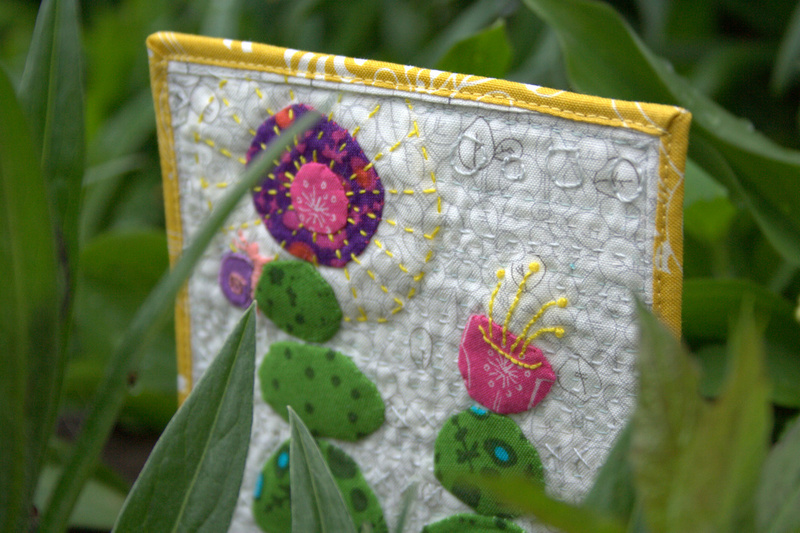 I densely hand quilted this mini mini with a variety of weights of Aurifil 2600-Dove (50wt, 28wt, and 12 wt), essentially hand-matchstick-quilting the 5″x5″ quilt. I improv-ed the quilting and included a few rows of X’s and one of little bubbly O’s for interest. I used a super thin binding for this (1″ strip to start, single fold), and although finicky to sew on, I really like the feel and aesthetic of the skinny binding. Even if it took ages, there are many positive, grateful, creatively generous thoughts stitched into this mini mini, Allison! I hope you like it! This next mini mini quilt was an experiment in how small can you go, and I determined that I reached my tiny threshold, at least with this foundation paper pieced pattern. The intended recipient of this mini mini is a big fan of the color purple, and I also knew I wanted to make her a feather mini mini. I wanted it to be unique, though, so I designed my own teeny foundation paper pieced pattern of a geometric feather. I absolutely love tiny stitching, mostly because of the giggles that reflexively bubble over while I’m piecing the ridiculously tiny pieces. This tiny feather was no different, until it came time to sew the two sides together. The seam was crazy thick; so thick, I had to hand crank my sewing machine to get the needle through it without breaking (I broke a needle trying the first time). 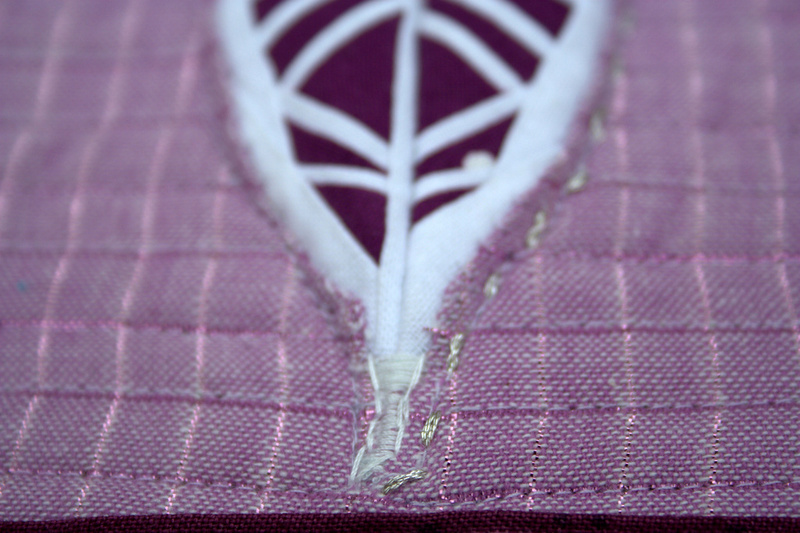 With a seam that thick, you can guess how great my chances of pressing it flat might be–slim to none! My solution? I stuffed actual wool batt behind the feather and then quilted around it as best as I could. It’s not exactly trapunto; it’s more a stuffed feather! My reverse needle-turn applique skills have room for improvement, and the shaft of the feather didn’t work as well as I had hoped. I decided to embroider over it with 12wt Aurifil to try to give it a more intentional look, and I’m much happier with the result. The Anna Maria Horner loominous fabric was the perfect background, and I machine quilted horizontal lines with 50wt Aurifil 2560-Iris. I used the backing as binding and folded over a larger portion on this mini mini quilt, since I felt it needed a stronger frame due to the visual weight of the 3-dimensional feather. Mini mini quilts certainly keep me humble, since every little stitch is visible, and the wobbles and less-than-perfect corners are part of the charm. 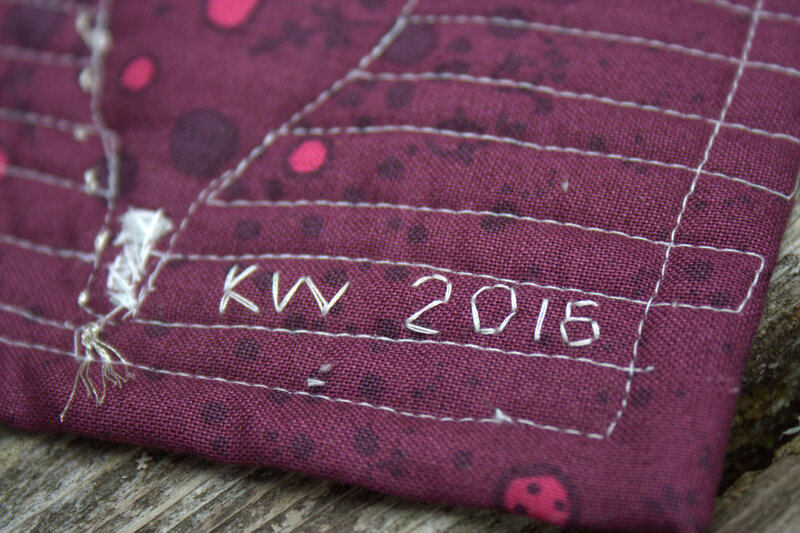 I signed the back with quick embroidered initials and date, since I feel strongly about signing all creations, no matter how small. Both of these mini minis are going in the mail today. 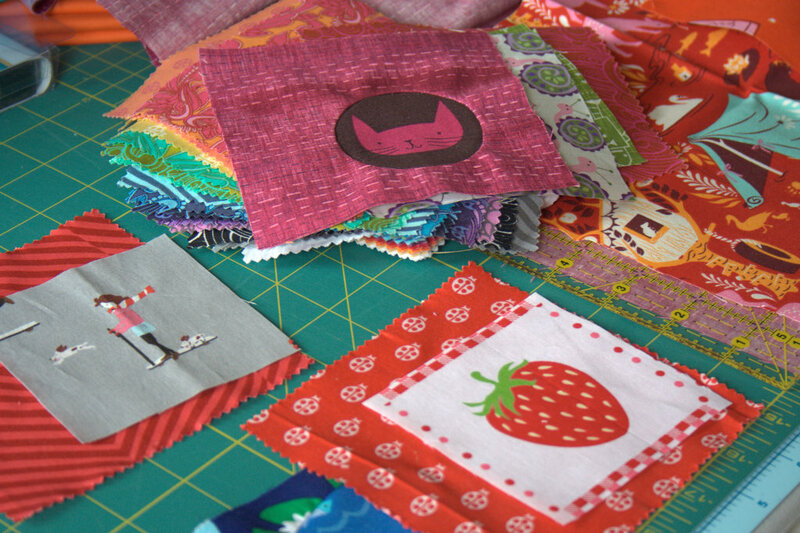 Once I finish a bit more of the projects on my to-do list, I am sure to revisit the mini mini quilt making scene. I still have one more promised mini mini quilt that is in progress for a friend who has already sent one in return (ages ago), and my very first mini mini swap for which I need to redo the binding. I think I agreed to swap with at least two others, but we left it open and relaxed and since I have not received a mini mini in return, I don’t feel *quite* so bad letting the creation of my mini mini quilt slide. All in good time, right? 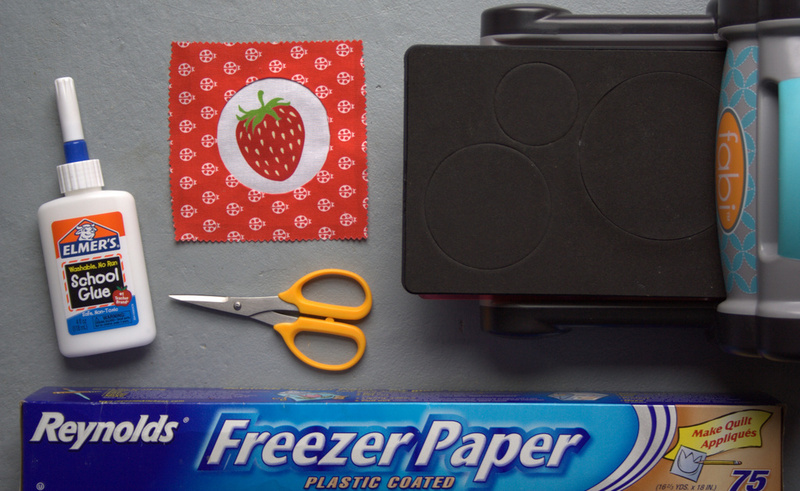 Have you made a mini mini quilt yet? If you feel so inspired, I encourage you to post a photo on Instagram with #MMminimini to join the fun (and enter to win prizes!). I’d also love to see it, so tag me @nightquilter so that I can see your tiny beauty! I’m linking up with Let’s Bee Social and will link with Crazy Mom Quilts Finish it up Friday, and TGIFF, since community is fun! My recent experimentation with improv curves has got me excitedly skipping down the path of curved sewing, eagerly trying every rendition of curves I can find. Mastering curves is one of my big goals for the year, so I’m happily nurturing this skill with every try. I have collected quite a sweet stack of fabric scraps featuring colorful creatures and items (many thanks to my most generous fellow quilters who sent scraps! ), and with Allison from Campbell Soup Diary constantly prodding encouraging me to try freezer paper appliqué, I figured it was finally time. Thus begins another new project–an eye spy quilt for my kids involving inset circles, drunkards path blocks, and any other curves I can find. Since I don’t have an actual mathematical compass in my house (gasp–appalling, I know! 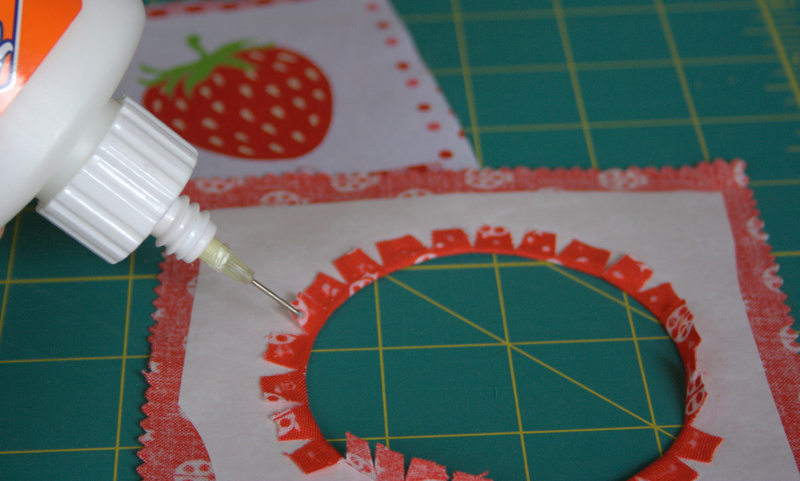 ), I decided to use my Sizzix die cutting machine to help with cutting circles, since of course the eye spy quilt will need to consist of curves of all kinds. 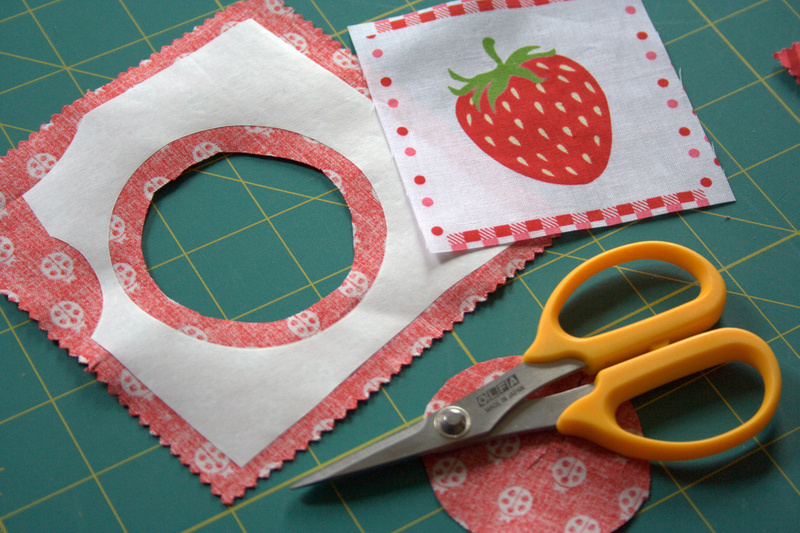 I only have the Sizzix BigZ L die that includes 2″, 3″, and 4″ circles together, so I could use it to cut the freezer paper but not the fabric. You can be sure the solo 2 1/2″ and 3 1/2″ circle dies will be in my next order! I grabbed some freezer paper, my washable school glue with Fineline tip, some appliqué scissors, my Sizzix fabi and circles and drunkards path dies and some fun fabrics. I used a combination of Allison’s fabulous tutorial for a mini drunkards path block and the techniques used in the six-minute circle and other improv sewing I’ve been trying. I basically followed Allison’s tutorial, using the Sizzix to cut the circle in the freezer paper, and ironing the freezer paper to the wrong side of my background square to get started. I clipped the curves and pressed them out around the freezer paper, actually gluing them a bit to the paper so that they would stay pressed back better (brilliant tip, Allison!). Then I diverted from Allison’s tutorial and switched into “six-minute circle mode”, running a bead of glue around the tabs. 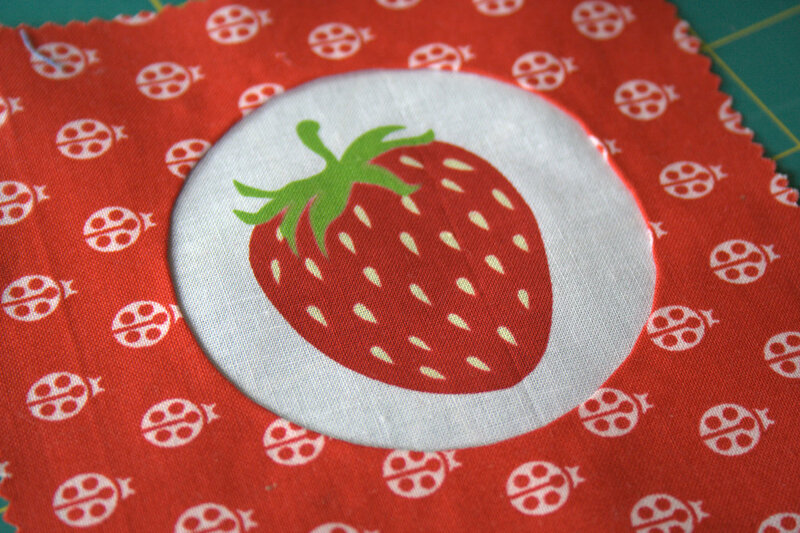 I then positioned the circle over the strawberry piece, pressing it with an iron to heat set the glue. 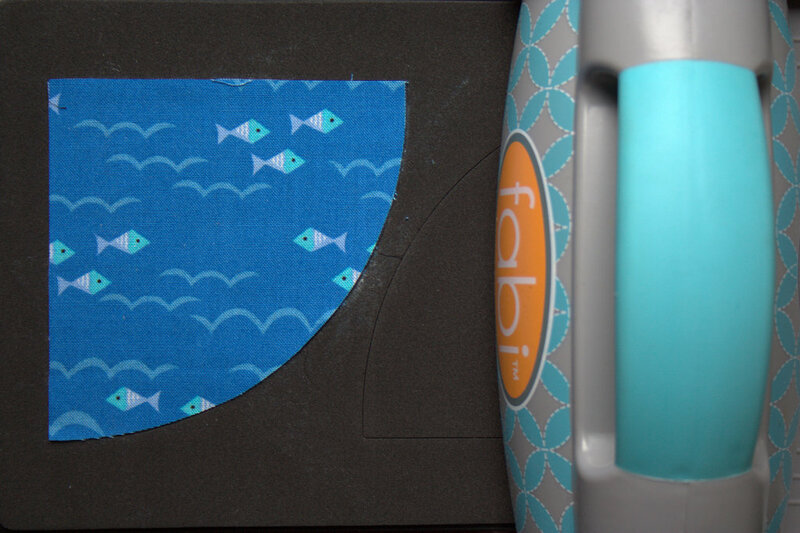 Once the tabs were heat set and secure, I gently pulled the background fabric up and slowly stitched around the inside edge of that freezer paper circle using a zipper foot. 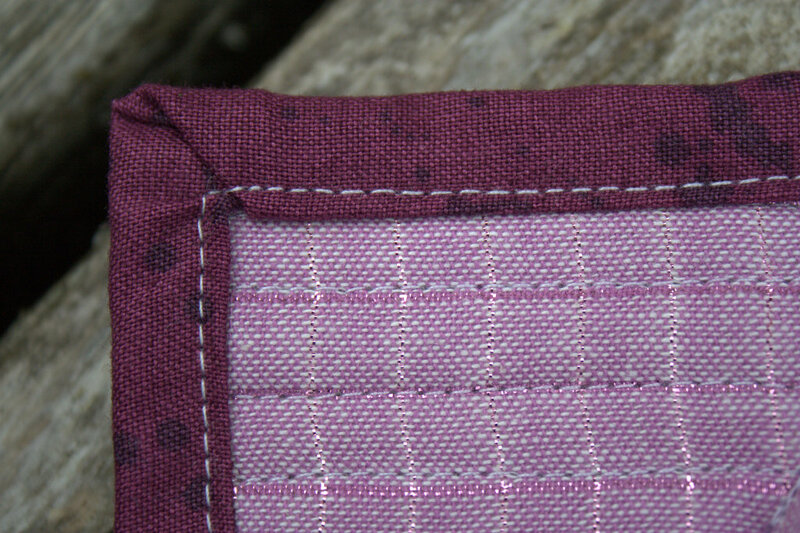 That way, these inset circles are sewn and secure, but the stitches are still hidden like with actual curved piecing. 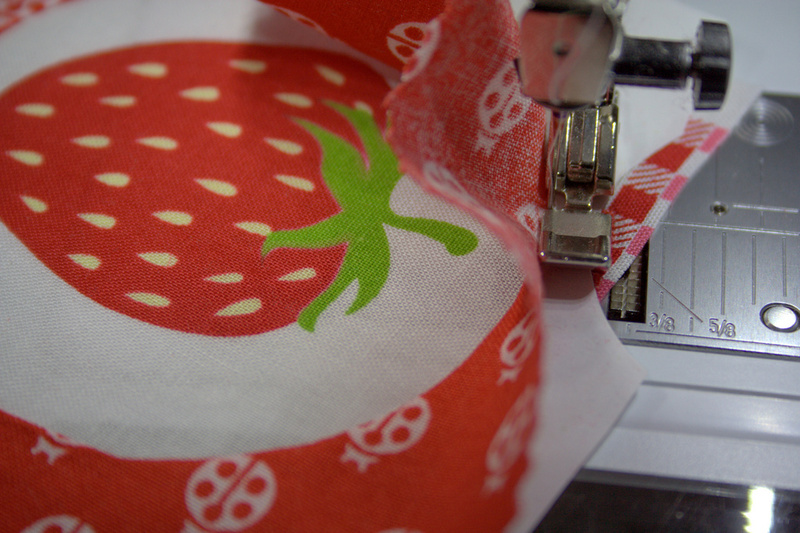 Then I trimmed the excess fabric from around the strawberry, creating a 1/4″ seam allowance. I LOVE the outcome! I also think this took even less than six minutes, which is kind of amazing in my book. Only a couple hundred more squares to go! I don’t have a real firm plan for this quilt yet, other than I’m aiming to use 4″ and 8″ and possibly some 2″ blocks and aim for a smooth rainbow gradient as well as the eye spy fun within the blocks. 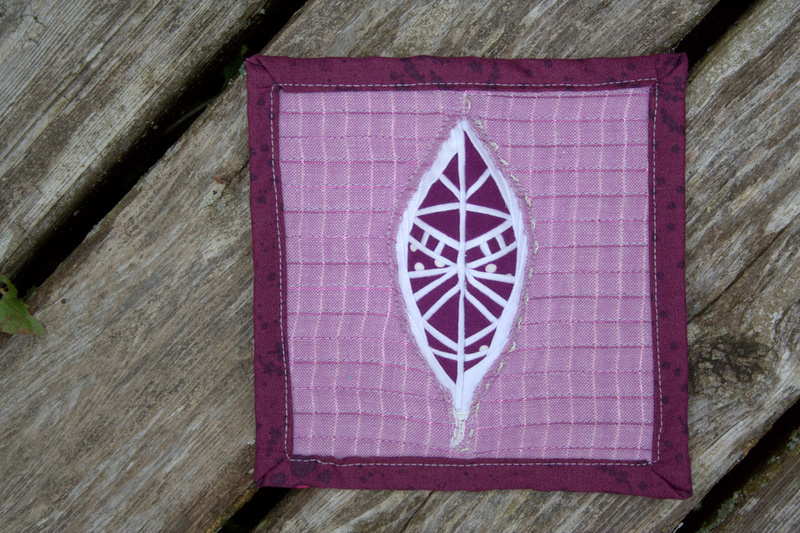 I have not yet decided whether I will include squares as well as circles, or if I will keep this a purely curvy quilt. What would you do? As you can see, I did give one drunkards path block a go since I have a drunkards path die that finishes at 4″, but I clearly need more practice with actual curved piecing. 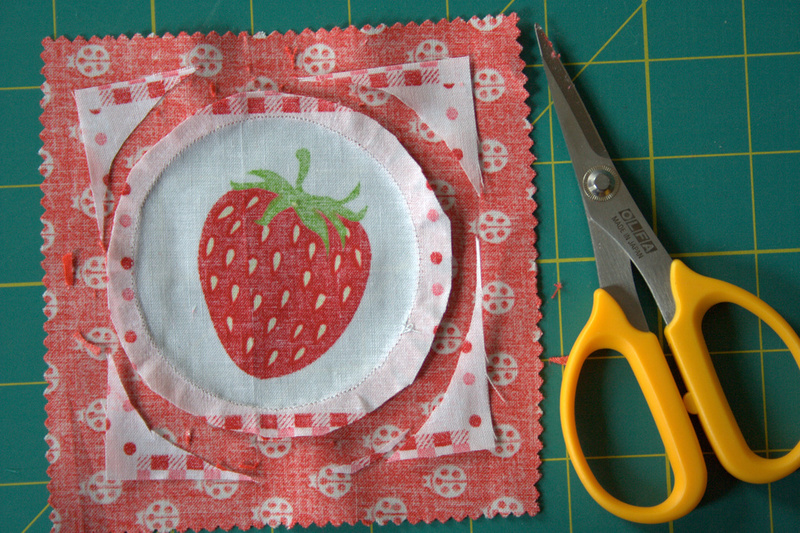 It ended up a bit wonky and smaller than 4 1/2″ (for visual reference, the strawberry and cat blocks are about 5 or 5 1/2″ square since I plan to trim them down at the end and I wanted some wiggle room). Next time, I’ll try glue basting for the drunkards path block, too, I think. It’s worth a try! I’m linking up with Lorna at Let’s Be Social, since I’ve added yet another project to my works in progress pile. After this one, I’m going to focus on finishing what I’ve started for a while!